What’s possibly even wore, as The Wall Street Journal points out this week, is that many people didn’t know what IHOP stood for in the first place. Granted, this is based on a very unscientific poll, more of a “person-on-the-street” thing, asking questions in front of IHOP restaurants of people who have just eaten there. 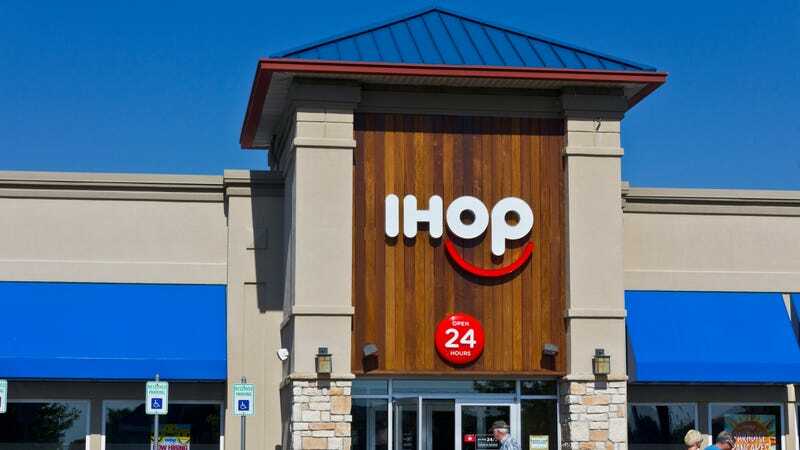 Despite the fact that the chain touts 24-hour breakfast, “pancakes” didn’t immediately come to mind for many of these people when asked what IHOP stood for. (Said one, “I’m drawing a blank.”) Although International House Of Pancakes was established in 1958, it changed its logo to IHOP in 1973 (adding a kangaroo), helping to kick off many years of misidentified acronyms. So the “burgers” switch now probably only seems even more confusing. WSJ points out that “international” part is sketchy too, as “there are only two “international” pancakes on the menu: the Belgian Dark Chocolate Mousse Pancakes and the Mexican Tres Leches Pancakes. The Rooty Tooty Fresh ‘N Fruity is of unknown provenance.” Sick burn, WSJ. Takeout editor Kevin Pang also noted that the new “international” burgers were decidedly on the domestic side. In a subhead, WSJ also notes that this name change is temporary, so hopefully this IHOB madness will end shortly. But we wouldn’t be surprised if IHOP then redesigned its logo again to bring to mind fewer tampons, more actual pancakes.